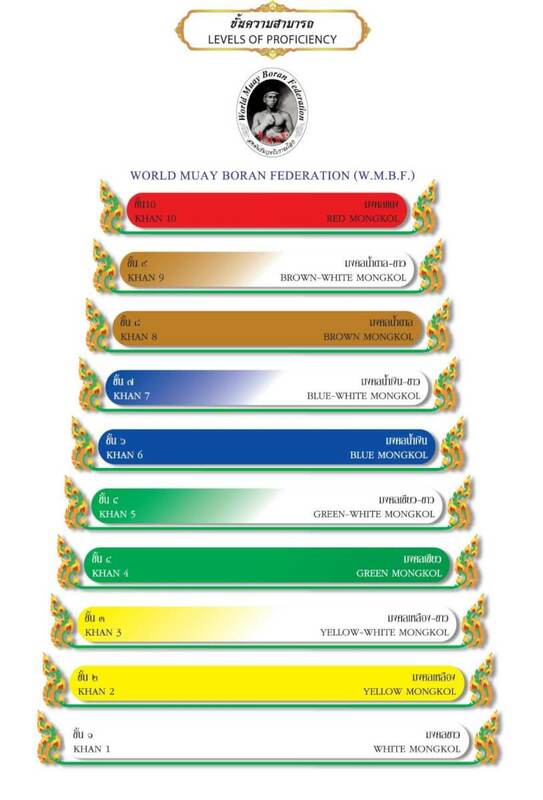 The World Muaythai Organization (W.M.O) and World Muayboran Federation (W.M.B.F) are recognized and registered under the Kru Muay Thai Association (KMA). Kru Muay Thai Association (KMA). Kru Muaythai Association (KMA) is registered, given full authority and mandate with permit strictly under the guidelines, rules and regulations of the office of National Culture Commission, Ministry of Culture on 9 May 2003 (T.167/2546). The Kru Muaythai Association is an established organization made up of Masters and Grand Masters of Muay Thai Boran, with the commitment to promote, register, support and develop a standard of Muay Thai curriculum for better learning and understanding from students Worldwide. By creating a structure for learning and teaching (khan grade) through a professional syllabus of set levels from student to teacher and mastery to be accepted as an educational program within the Kingdom of Thailand and Internationally. 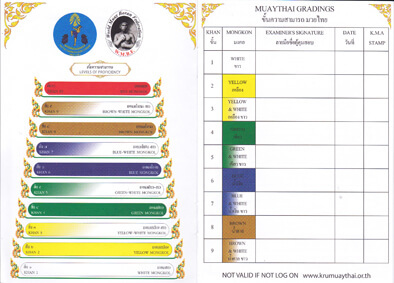 “Muay” means unarmed fight and “Thai” represents Thai people and the origin of the martial art, “Boran” means ancient. In the past, Thai warriors learned how to use Muay Thai as part of combat combined with weapons such as hand held swords and spears against enemy in war. Following the war, “Muay” had been used to test the peoples fighting skills, in competition of strength and preparation for battle. Later, Muay Thai developed as a sport and for entertainment taken advantage of for gambling. In recent years, Muay Thai has developed much further with many promotions and competitions worldwide. Thousands of foreigners travel to Thailand every year specifically for learning the art of muay thai. In Thailand alone there are numerous stadiums and promotions all over the country for Muay Thai fights. The introduction of new rules and regulations to muay thai as sport means many of the ancient techniques have been forgotten. 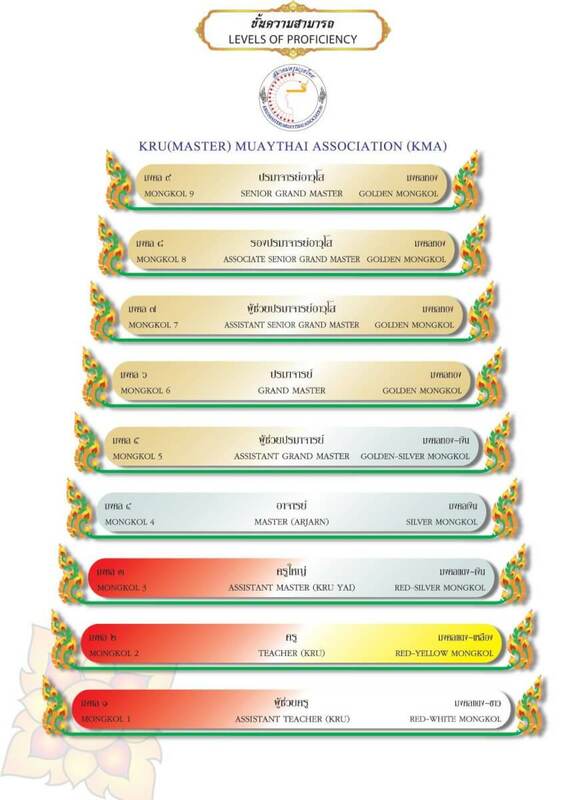 Example of K.M.A. Student booklet for examination and grading. Kru Muaythai Associations has many activities which work together with many countries; North America, Europe, the Middle East and Asia as well as in Thailand since B.E. 1995. We have organized Muaythai competitions, Amateur World Championships, Amateur European champion competitions and began the 1st Wai Kru Muaythai cremony at Ayutthaya Province, as well as an array of meetings, training and seminars for Kru Muay practitioners from around the World. The Kru Muay Thai Association (K.M.A.) recognizes the importance of the art of Muay Thai and the value of a great teacher as a leader of Muay Thai. The headquarters for the Kru Muay Thai Association are located at Luktupfah Muay Thai Academy in Bangkok, Thailand. Here students are able to take courses in Muay Thai, Muay boran and Kru certifications with official examination and grading ceremonies assessed by Grand Master Woody.